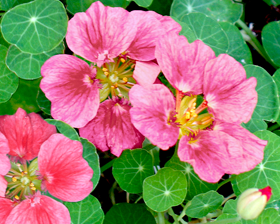 Very rare, delightful ruffled blooms in creamy pink shades sit well above the fresh green foliage of this easy-to-grow hardy annual nasturtium. Plants are neatly compact and look stunning planted in borders or containers. Grow some in the vegetable plot too and use the flowers and leaves to brighten salads. Sow outdoors where they are to flower. Sow seed, 20mm deep in drills 30cm apart in well-cultivated soil which has been raked to a fine tilth. Water ground regularly, especially in dry periods. Germination usually takes 7-12 days.